Bought from CMC at Daybrook Square Nottingham, here I am posing for Lee Kearney (who handled the sale) to take my place on their wall of fame. 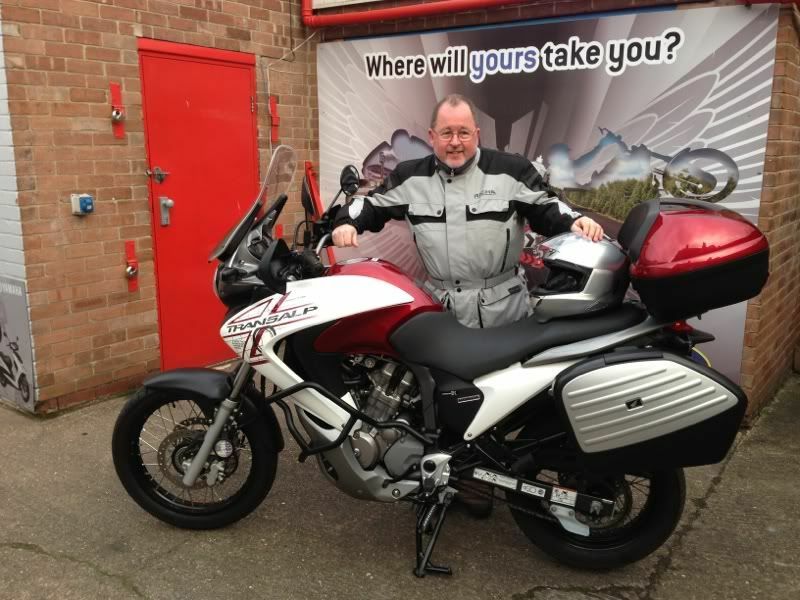 Collecting my Transalp from CMC Nottingham, both side and centre stands down. On collection the bike had 9,166 miles on the clock, some of which were due to my test ride. The engine appears so much more peppy than the Deauville, and I love the burble that it makes. It is tall (well, taller than the Deauville) but not uncomfortably so, my only difficulty being actually getting onto it, but once on I'm comfortable and happy. Once on board the view is excellent and being white cars seem happy to move over as I approach so it obviously has presence. The view in the rear mirrors, I can actually see what is behind me (always something of a mystery on the Deauville). I'm having some difficulty getting it up onto the centre stand which is positioned slightly further back and behind the natural fulcrum point due to the catalytic converter, but there appears to be a knack and I'm getting there. Higher bars and grab handle position don't help in this respect either but are perfect for the riding experience. I'm not a fan of always-on lights, but hey, I can live with it. Also I'm not impressed with the way the top box and paniers operate and the lack of cubby holes to store bits in, but then in that respect the Deauville knows no peers. Honda have just announced that production of the Transalp (like that of the Deauville) ceased at end of 2012. The handlebars started to look tatty (paint peeling off) so I ordered a set of Rental bars from Rob at Racing Lines on Mansfield Road, Derby. They took a few days to come in but a Saturday spent in the garage saw the old Daytona grips removed, handlebars stripped, standard throttle tube modified for the fitting of the hand crash protectors, locating lugs that go into pre-drilled holes in the Honda bars were removed (using my Dremel) and then everything was reassembled using the new parts. Inner bar end weights were removed from the Honda bars but wouldn't go into the Renthal bars, but I can't say I've noticed any real difference - maybe there is slightly more vibration of the mirrors but they remain perfectly useable. The new hand guards will give more crash protection but they are lacking the weather (rain) protection of the standard items so I've started a little modification of those that will (hopefully) resolve that situation. So far I have done more than 2,250 miles and it is still a happy and developing situation. My local office has just been moved to Mere Way, Ruddington which will mean 45 miles a day commuting and see the miles rack up a bit quicker, but then I prefer riding to cleaning and polishing any day and it will never be a concours event winner. Rear tyre is starting to square off and squirm around on 'tram lines' in the road so some new tyres may well be next on the list, but no rush, I know what the bike is doing and the current BW502s still grip well. The result is a very usable Touring motorcycle with adequate performance and good fuel economy if ridden "normally" but is willing to drink fuel in the manner of a confirmed heavy drinker if you decide to really "make progress". The front sprocket change means that the speedo is now only 5% optimistic instead of 9% and is recommended if you spend absolutely no time off-road where you'd probably need the standard or lower gearing. As it is I can maintain "motorway speeds" in comfort without the buffetting from other screens I have tried (standard and Honda touring) while getting mid 50s mpg. If I was anticipating doing any off road riding then those Annakee 2 tyres would have to be replaced with serious off road tyres, but that would compromise road use, which is where I am at.